With the NFL scouting combine now one day away, it’s time to separate the contenders from the pretenders. In an epic weekend of drills and activities, the best college football players in the world will gather together inside Lucas Oil Stadium (Indianapolis) to put their skills to the test. Once again, the Southeastern Conference has asserted its dominance. 70 players from the SEC will take part in the NFL combine. Of the 70 players, 12 are from the Alabama Crimson Tide. For AJ McCarron, CJ Mosley, Ha Ha Clinton-Dix, Cyrus Kouandjio and others, Saturday will be their first step of NFL preparation. Despite not having to throw against Johnny Manziel, McCarron will still have his work cut out for him at the combine. After skipping out on the 2014 Reese’s Senior Bowl, McCarron will have to battle against Blake Bortles, Teddy Bridgewater, Derek Carr, Tajh Boyd and more. In the 2013 season, McCarron improved on his deep ball and back shoulder throws. We saw glimpses of him in the aspect of trying to be mobile as well. 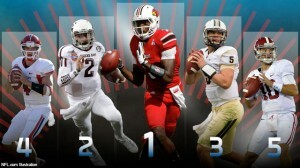 Should McCarron be more like Manziel, Bridgewater or Boyd in the realm of mobility? No. McCarron doesn’t need to run a 4.3 in the 40-yard dash. All he needs to do in the combine is just show his ability to move the pocket with his feet and be adequate about it. Though he may not have to show much mobility, McCarron’s arm strength will be watched at the combine. NFL scouts will be looking to see can he fire the ball out quickly and maneuver through a three, five and 10-step drop well. In the NFL, quarterbacks must have a sense of when pressure is coming. McCarron will be tested on how well he can anticipate the blitz and get the ball out to his hot receiver. For CJ Mosley, it’s time for him to take the “alpha dog” mentality he had at Alabama and apply it in the combine. As far as speed and lateral quickness is concerned, Mosley has that dialed in. He understands how to break down and make tackles in space. The challenge for Mosley in the combine will be how fast can he take on blockers, get off blockers and find the ball. Another challenge for Mosley will be the ability to generate a pass rush. With the Crimson Tide, he was known more for stopping the run and playing pass coverage versus rushing the passer. The NFL is known for having devastating defensive lineman and hard hitting linebackers. Though Mosley fits the bill as a hard hitter, can he really be that guys to go after the passer at any given moment. Most Alabama fans were shocked when Cyrus Kouandjio made his decision to declare for the NFL Draft. When he came to the Capstone, Kouandjio was surrounded by all the hype and potential. On one hand, he didn’t blossom into the offensive lineman we expected; however, he has the ability to make it in the NFL. With Kouandjio, the question is simply does he have the mindset? In some instances this season, Kouandjio looked like a first-round draft pick. At other times, he took plays off and got manhandled off the ball. For Kouandjio, his test in the combine is can he handle the speed of the competition? NFL speed and college speed are two different speeds. In the NFL, offensive lineman must be light on their feet. They have to move off the ball quickly at the point of attack to pass and run block. Some NFL analysts question Ha Ha Clinton-Dix’s speed, but in reality safeties don’t really need to be fast. The safety’s job is to protect the endzone as the last line of defense. Clinton-Dix did the job well at Alabama. This season, he finished fourth on the team in tackles (52) with two interceptions and four pass breakups. As a safety, your job is to play the ball as well as the receiver. Clinton-Dix has great instincts and understands how to locate the ball in the air. He is a hard hitter and does well in run support. Outside of the 40-yard dash, 20-yard shuttle run and guarding receivers, the challenge for Clinton-Dix will be can he play man-to-man coverage? At Alabama, he was mainly a zone coverage guy. This gave him the ability to freelance around and make huge plays. It’s a good thing to specialize in something, but it’s even better to be a jack of all trades. Like Kouandjio, many fans expected Adrian Hubbard to return next season. Hubbard was recruited to Alabama in hopes to restore the pass rush. Hubbard was brought in under so much hyped, but didn’t emerge as the finished product. Weighing in at 6’6” 251 pounds, Hubbard has the build and the speed to be a ferocious NFL linebacker. He just doesn’t possess the intensity right now. Hubbard kind of draws the comparison to South Carolina’s Jadeveon Clowney. Both guys are tough, physical and athletic, but they take plays off from time to time. The difference between Clowney and Hubbard is Clowney knows how to turn on his intensity; Hubbard does not. Hubbard finished ninth on the team in tackles this season (30) and totaled three sacks. With five receptions for 53 yards and a touchdown, Kevin Norwood’s senior bowl performance really helped his draft stock. At Alabama, Norwood was Mr. Consistent. He finished second on the team this season with 38 receptions for 568 yards. Norwood led the receiving core in touchdowns with seven. He has great hands and always seems to make the clutch reception when it’s needed. Norwood is a great route runner and has the ability to create separation at the line scrimmage. Norwood’s challenge will be to try to get his speed up a bit more in the 40-yard dash. Despite being clocked at 4.6 on the gun, Norwood is faster than what the numbers say. It doesn’t matter how much speed you have, at the end of the day all NFL coaches want is a guy who will catch the ball. Norwood is definitely the guy. The return of Vinnie Sunseri to Alabama’s secondary would have been nice next season. Sunseri decided to forgo his senior season and enter the draft. Does the ACL injury throw a question mark in his draft stock? Yes. However, his rehab is right on schedule with the draft. Sunseri is not particularly a fast defensive back. He must perform well in the 40-yard dash. His skill set lies in his knowledge of the game. Sunseri excels in tackling and making plays on special teams. He is great in reading the quarterbacks eyes and deciphering where the ball is going. Before his injury, he had two interceptions returned for touchdowns. Like Clinton-Dix, Sunseri’s challenge will be can he play in man-to-man coverage? With the combine vastly approaching, these Alabama players will have to put it all on the line in hopes to impress an NFL franchise. Nick Saban has taught these players to do the right thing and do it the right way. Will the players take heed and leave their all on the field? The answer to that question lies this weekend at Indianapolis.